Many athletes compete for a spot on their sport's Olympic team, but they usually don't do so when they're suffering from an injury. However, at the Olympic Track and Field Trials in July, Allyson Felix qualified for the 400-meter dash with a sprained ankle. Not only did she make it into the competition, but she also set the fastest time for the 400-meter for 2016, at 49.68. Even though she didn't make the cut for the 200-meter race that she'd hoped to run in, the track star is likely to come out on top in the 400-meter final on Aug. 15, after placing first in the semifinals on Aug. 14. While it's Felix's first time running the 400-meter at the Olympics, the 30-year-old has a few gold medals to her name already. At the London Olympics in 2012, she earned the top spot at the podium in the 200-meter dash, 4x100-meter relay, and 4x400-meter relay. This made her the first female athlete in 24 years to win three gold medals during one Olympic run. Her first gold came in 2008, when she ran the 4x400-meter relay in Beijing. She also earned two silvers for the 200-meter dash at the 2004 Athens Games, when she was 18 years old, and then again in 2008 in Beijing. Felix suffered her ankle injury while exercising on a medicine ball two months before the Olympic Trails, which she's still recovering from. Her team had originally worked with the International Olympic Committee to schedule the 200- and 400-meter dashes so that she had the opportunity to compete in both. However, that proved unnecessary, as the injury affected her performance during the trials and cost her a spot on the 200-meter race. It's a little disappointing we won't get to see her run in her main event this year, but it makes watching the 400-meter all that more exciting to know it's not the event that she's used to doing, yet she still has the chance to conquer. 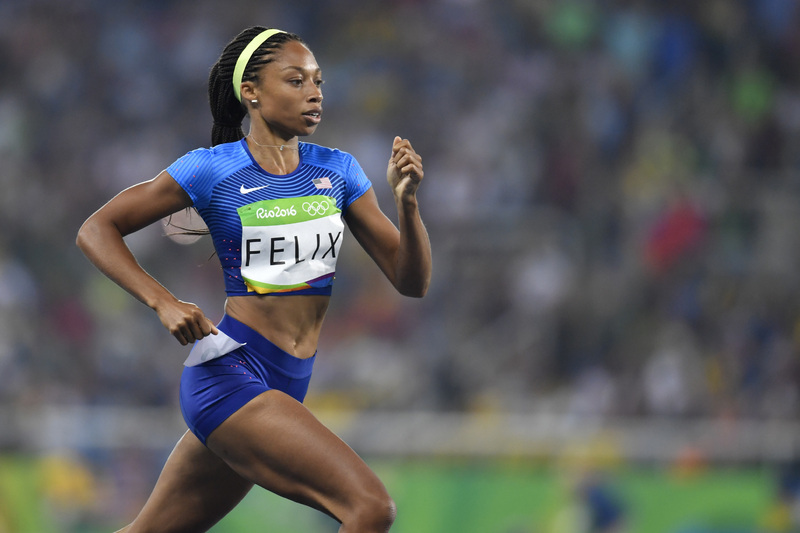 "[It was] pretty heartbreaking," Felix told ESPNW in an interview about not qualifying for the 200-meter. "It's my favorite race, I always call it my baby. I never thought of myself going to the Olympics and not running the 200. So it's been tough to realize that my focus now has to shift." After watching women like Simone Biles, Katie Ledecky, Aly Raisman, and the U.S. Women's Basketball Team dominate their events at Rio, it would be great to see Felix overcome her obstacles and take home the gold once more.